More than 150 recipes plus family remembrances and cultural history make up this irresistible salute to Cracker heritage – with an Introduction by Pat Conroy. Crackers, rednecks, hillbillies and country boys have long been the brunt of many jokes, yet this old southern culture is a rich and vibrant part of American history. 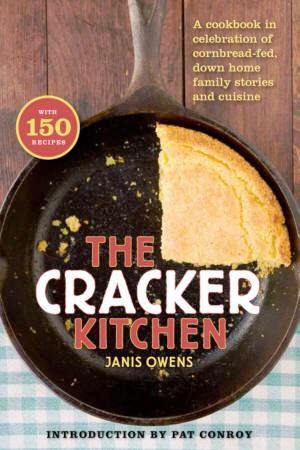 In The Cracker Kitchen, novelist Janis Owens traces the root of the word Cracker back to its origins and through its proliferation in America to offer an anthropological exploration of this group of proud, fiercely independent Americans who have a deep love of their families, country, stories and food. Owens presents a hilarious and heartwarming celebration of Cracker culture sure to entertain anyone with a taste for fried chicken and fish frys, a passion for hunting season, and a secret love of NASCAR. With more than twenty different seasonal menus, Owens offers a full year’s worth of eating and rejoicing. From an Easter dinner to a Fall Tailgate party, to a February celebration of Soul Food in honor of Martin Luther King, Jr., the recipes for such Cracker favorites as Baked Armadillo, Sausage Cheese Balls, and Velveeta Rocky Road Fudge are paired with Owens’s personal family stories and entertaining essays on Cracker culture. The Cracker Kitchen is a charming, irresistible celebration of family, storytelling, and good old-fashioned eating—sure to appeal to anyone with an appreciation of Americana. — Jill Conner Browne, author of the best selling Sweet Potato Queens series. — Ethan Becker, author of Joy of Cooking.